“Do you have a hat yet?” she asked. This seems to happen to me nearly every day. Things, people, opportunities come to me. They come to you, too, if you start looking out for them – and believe that they exist. The hat? That was my friend Elizabeth Anne who offered it. Remember the hike I wrote about yesterday? Well, did you wonder how I got from the end of my hike back to my car? Elizabeth Anne. She and a couple friends from my writing group just so happened to be taking a tour at Val-kill that day. They invited me to join them. I declined but said, “Hey – if I walk over there, would you mind bringing me back to my car after you’re done with your tour?’ They didn’t mind at all. They picked me up and Madeline said, “I’ve got a lot of food at my house – leftovers from yesterday. Would you all like to come back and eat some of it?” Well yes. After walking nearly 8 miles, I’d love to! And also have the opportunity to spend more time with these lovely folks? My how I’m blessed! I’m not usually one to quote the Bible. Nothing wrong with doing so, it’s just not something I find myself doing very often. But there’s some good stuff in there. What this all brings to mind is Matthew 7:7 which says something along the lines of, “Ask and it will be given to you; seek and you will find; knock and the door will be opened to you.” Those words always appear in my head in a song I sang a lot when I used to go to church. It’s a lovely tune by Karen Laffery. The backpack I’ll use when I walk the Camino was bought at an outdoor gear tent sale. 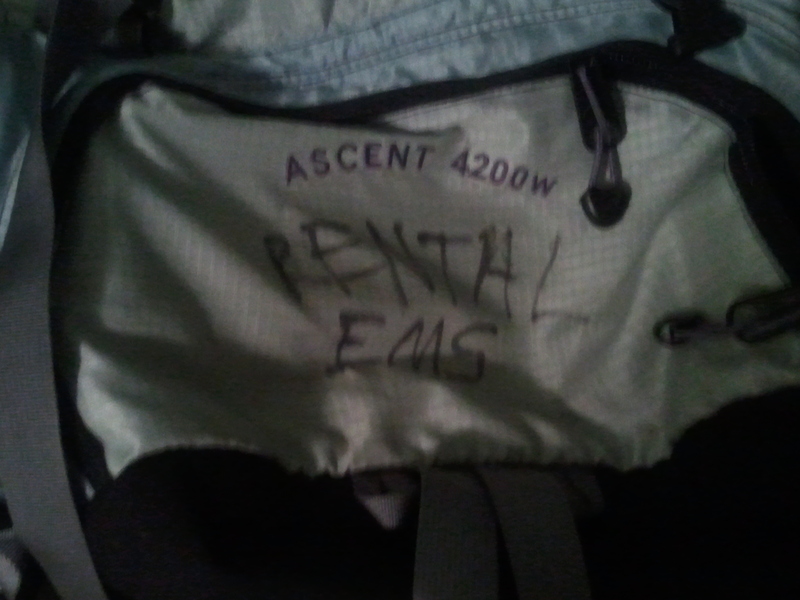 It’s a used pack – clearly indicated by the words “Rental EMS” written across one of the pockets. I was thinking it’d be nice to have something to cover those words. Today, I found one thing that will help me do just that. My hometown is blessed with four National Parks, all just a few miles apart from each other. In 2007, property was acquired that allowed all four to finally be connected by walking trails. Years ago, as a Park Ranger at Vanderbilt Mansion (one of the four aforementioned parks), I would tell people about the trails, but couldn’t speak about them all from experience. Today, that changed. Today, for the first time, I walked from Vanderbilt Mansion to the FDR Home to Eleanor Roosevelt’s Valkill. It took me two hours and 15 minutes and my pedometer told me I walked a total of 7.5 miles in that time. Wow, did that feel good! A waterfall near the Lower Gatehouse at Vanderbilt Mansion National Historic Site. The back of the FDR Home viewed from the Hyde Park Trail. I was plugging along…writing three pages when I woke up, meditating, then taking off for a walk. Then I started pushing off my walk til the afternoon. Then, I got sick. I had barely enough energy to walk downstairs, let alone walk four or five or six miles each day. I was on a role for so long, and then suddenly off track. So I’m feeling better. But don’t want to overdo it too soon and get sick again. So any prayers and well wishes for getting back into my routine would be appreciated. And if you’re in the Hyde Park, NY area and want to go for a walk, let me know! 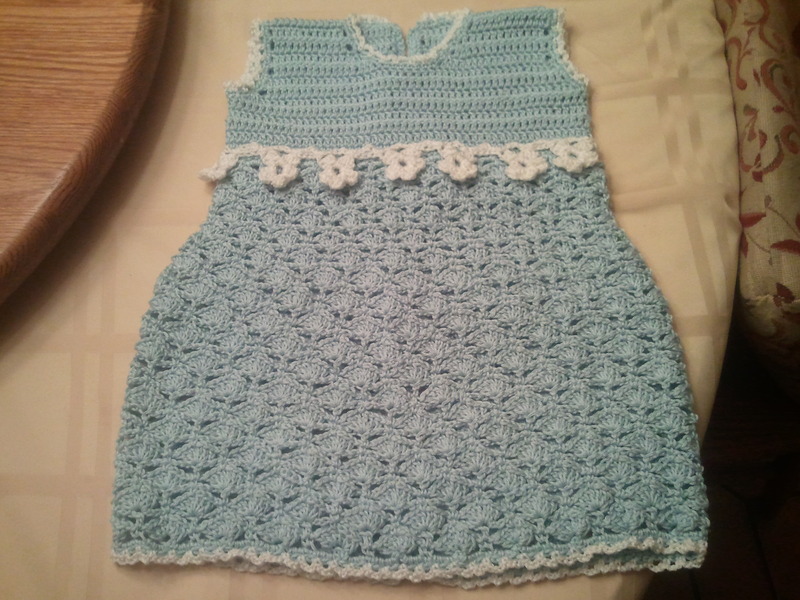 About this time last year, my then-two-year-old niece was the recipient of what I consider one of my best crocheted pieces yet: an adorable Seashells and Posies dress. I started and then re-started this dress at least three times before I finally got it right, but it was worth it. It’s the cutest thing ever, and Ava loves it. I am thrilled every time my sister chooses to dress my niece in it. Ava wore the dress for her little sister, Isabella’s, christening last month. My sister considered having her wear it for Easter this year. When my mother asked what Isabella would wear, my sister said, “I was kind of thinking I want them to wear the same dresses this year.” Was this Liz’s way of asking if I’d make the same dress for my other niece? I remembered back, not so fondly, to the days Liz would call me “Granny” as I sat and crocheted. I never thought I’d see the day when she’d actually dress her kids in clothes I made for them, let alone imply that she might want me to make more. But God has a funny way of messing with us. My sister actually likes the things I make her kids. And tells me so. Which stills my heart each time I hear it. So as I saw it, the challenge was on: either I make Isabella a dress just like Ava’s or they wear store-bought dresses for Easter. “Do you think you can finish it by Easter?” Liz asked. Um, I really have no idea. It took me a month to make the last one. And three false starts…. Then I started thinking about a couple other projects in my head that I’d yet to start. A baby blanket and a wedding blanket- both of which need to be done in the next couple months. Minor glitch: I’m going to be out of the country for the majority of the next couple months. So all these things need to be made….really soon. His timing (as usual) couldn’t have been more perfect. Well, there’s never a good time to get sick. But some times are better than others. I happened to be sent this lovely little illness not while on the road, not while in another country, but while in a room upstairs in my parent’s house. The yarn for all three projects had just come in (minus one skein that my youngest sister Meg hunted down for me). And though I had no energy to leave the house for a week, I DID have enough energy to crochet. I am thrilled to report that I left the house today – for the first time in a week. I’m finally feeling better. Isabella’s dress? Just needs buttons sewed on the back and it will be finished. Baby blanket? Done. Wedding blanket? Well, here’s hoping…. Those words fueled my travels for many years. I first heard them when I was eighteen years old, standing in the Reception Hall at the Vanderbilt Mansion National Historic Site. Bedecked in my Park Ranger uniform, it was my job to greet visitors entering the home. After checking their tickets, I then told them all the things they couldn’t do: chew gum, take flash pictures, touch anything. When there was a lull at the front door, I’d eavesdrop on people’s conversations. If they said, “I wonder who that is?” while looking at the bust in the foyer, I’d pipe in, “We think that’s Zeus – but we don’t know for sure because there’s no documentation about it.” Most of the time that’s all it took for visitors to realize I wasn’t there solely to enforce the rules. I actually knew about this place and could tell them some pretty interesting stuff. Bus groups were my favorite. First, because I loved when it was busy. And in my first season as a Park Ranger, we could have as many as five buses of tourists some days. Secondly, bus groups were mostly senior citizens and I love those folks. They’re usually funny and wise, and I got equal parts of laughter and wisdom in my conversations with them. I didn’t realize it then, but now I know why I like working with them so much: we have the same outlook on life. Do what you want now, because you’re not getting any younger. I remember that little white-haired lady, name tag around her neck, dispensing her advice shortly into our conversation. She lamented that she wasn’t walking so well today and blamed it on not being in her own bed the night before. The crux of her advice was that, as a young person with little money, I could afford to stay in cheap places with crappy beds – and wouldn’t have to pay for it with aches the next day. I remember telling my boyfriend (a Park Ranger on duty with me that day) what she said. I remember we took her words to heart that summer. Though that relationship didn’t last, her words stuck around. As I recalled her advice snuggled into my bed last night, I laughed to myself thinking, “You know, Rebecca, you’re not going to have three pillows to sleep with on the Camino…” Though then I thought, “Maybe I can bring a couple – pillows are light.” I did just pull out my backpack yesterday and wonder what I would fill all that space with.